In each of the left cells above, the number ‘n’ whose logarithm is written in the right cell is written in red. The logarithm of a number n to a base a is x, where the number n is equal to a raised to the power x. 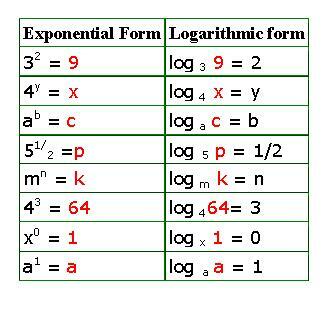 2. the logarithm of any number to itself is 1. 3. logarithm of only positive numbers exists. Note: Logarithm of a number can be negative, but logarithm of a negative number does not exist. But log 3(-3) does not exist. Therefore, in each of the left cells in the above table, the number in red is always positive.Let us now solve a few problems applying the logarithm formulas and concepts learned so far.